The Johnstown Marathon has been a part of our community for 40 years. 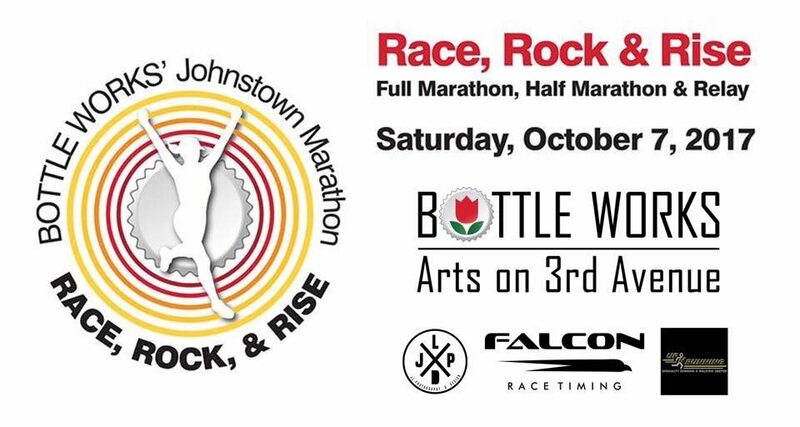 On Oct 7, 2017, the Bottle Works brings it back with the Race, Rock & Rise Full Marathon, ½ Marathon and Relay. A new route that traverses the city and its surrounding communities will showcase some of the local trails. Please join us all day Saturday for the race and festival activities into Saturday evening including a band on the main stage and an open jam on an alternate stage. A block of hotel rooms are available at the Holiday Inn Downtown Johnstown, 250 Market Street, Johnstown, PA 15901. Refer to the Race, Rock and Rise room blocks. Friday afternoon at 4:00 is packet pickup. Please join us that evening for a Spaghetti dinner at the Bottle Works. Race, Rock & Rise runners eat for free. If friends and family want to join you for the spaghetti dinner, please go to the online registration link below and visit the STORE to purchase tickets. · Please join us Saturday afternoon and into the evening for the first annual Race, Rock & Rise Festival. More details for runner specials. Registration includes race t-shirt & tumbler, Friday spaghetti dinner, post-race food & beverage and Saturday music & festivities.